LONDON — Leaked British government documents call into question ex-Prime Minister Tony Blair’s public statements on the buildup to the Iraq war and show plans for the U.S.-led 2003 invasion were being made more than a year earlier, a newspaper reported Sunday. Britain’s Sunday Telegraph published details of private statements made by senior British military figures claiming plans were in place months before the March 2003 invasion, but were so badly drafted they left troops poorly equipped and ill-prepared for the conflict. The documents — transcripts of interviews from an internal defense ministry review of the conflict — disclose that some planning for the Iraq war had begun in February 2002. Maj. Gen. Graeme Lamb, then head of Britain’s special forces, was quoted as saying he had been “working the war up since early 2002,” according to the newspaper. Critics of the war have long insisted that Blair offered then-President George W. Bush an assurance as early as mid-2002 — before British lawmakers voted in 2003 to approve U.K. involvement — that Britain would join the war. Britain’s role in the Iraq conflict — which triggered massive public protests at home — left 179 British soldiers dead. Two previous British studies into the war have been carried out. One cleared the government of blame for the death of David Kelly, a government weapons scientist who killed himself in 2003 after he was exposed as the source of a British Broadcasting Corp. report that accused Blair’s office of “sexing up” prewar intelligence. LONDON — A panel investigating Britain’s role in the Iraq war begins questioning witnesses this week in an inquiry that critics hope will humble former Prime Minister Tony Blair and expose alleged deception in the buildup to conflict. The investigation is the most sweeping probe yet into the war by any nation that was involved. It is expected to consider allegations Blair secretly backed President George W. Bush’s plan for invasion a year before Parliament authorized military involvement in 2003. The panel, which opens public hearings Tuesday, will question dozens of officials over several months — including Blair, military officials and spy agency chiefs. It will also seek evidence from ex-White House staff. Bereaved families and anti-war activists have long called for a comprehensive study to consider Britain’s role in a conflict that left 179 British soldiers dead and triggered massive public protests. In the United States, the 9/11 Commission examined some issues around prewar intelligence, and a Senate select committee identified failures in intelligence gathering in a July 2004 report on prewar intelligence assessments. Retired civil servant John Chilcot heads the panel of five officials — who include Winston Churchill’s biographer and an ex-British ambassador to Russia. Chilcot has acknowledged the study may not satisfy those who insist the war was unjustified and illegal. Chris Ames, an investigator who campaigned for an inquiry, said it likely represents a final opportunity to scrutinize the war. “This our last chance to get to the truth. People will want witnesses to drop the spin and be honest,” he said. 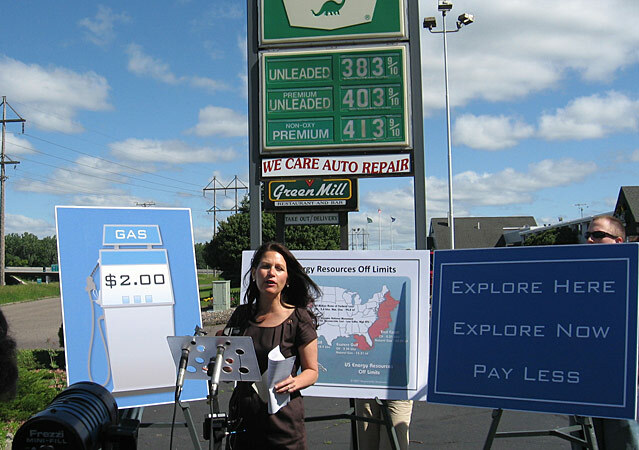 One-year retrospective: One year ago today, I noted that in the summer of 2008 U.S. Rep. Michele Bachmann claimed she could lower the price of gasoline to $2 a gallon in about two years by increased drilling, including offshore drilling and drilling in the Arctic National Wildlife Refuge; however, just a few months later the price at the pump dropped to nearly $2 in a matter of weeks, purely as a result of reduced demand during the economic recession.